As I think about the flavors that have influenced my thinking, many of them come from French cuisine: the flavors of olive oil, of garlic, the herbs from Provence and the south of France make one group of memories. The years I spent in mountains were filled with wild berries, fruits, flowers, honey, and of course, raw milk and fresh eggs direct from the farm, and the amazing cheeses from the region. Then one day, I went to live in Japan, for a year. There, I discovered a new set of scents, of cultural habits, new ingredients, new dishes, new drinks. One of these new ingredients was natto. Natto is made of fermented soybeans, and in a way it is a form of cheese. There are many parallels: cheese is made of milk, and a vegan alternative to cow milk is to make milk from soybeans. Then ferment the cow milk, or ferment the soybeans. 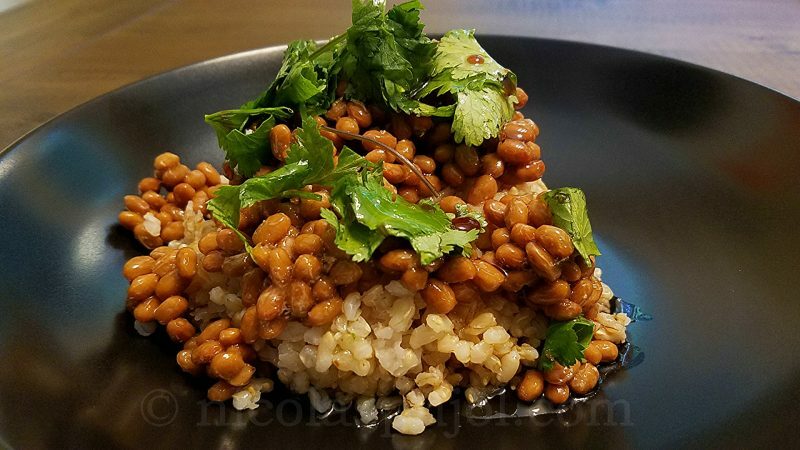 Many people are initially intimidated by natto’s smell and consistency, but the essence of the food is fundamentally a vegan form of cheese. The western world often puts cheese on top of salads, pastas, pizzas, the list goes on. 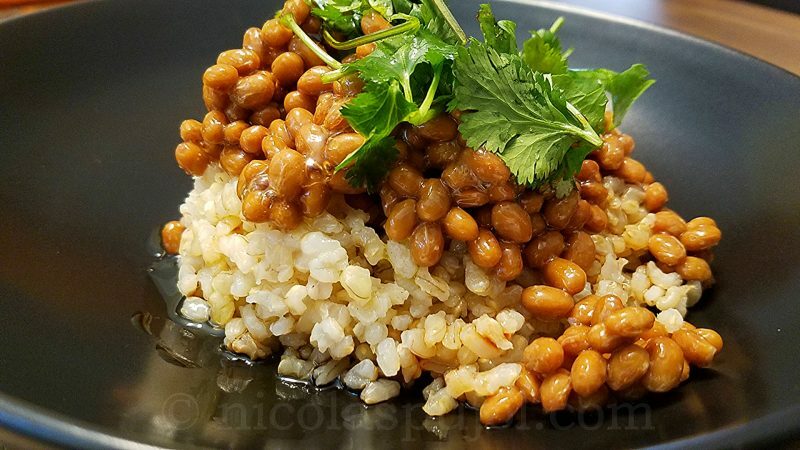 While natto dishes are typically Japanese makings, it feels fitting to try it on cuisines like that of France. 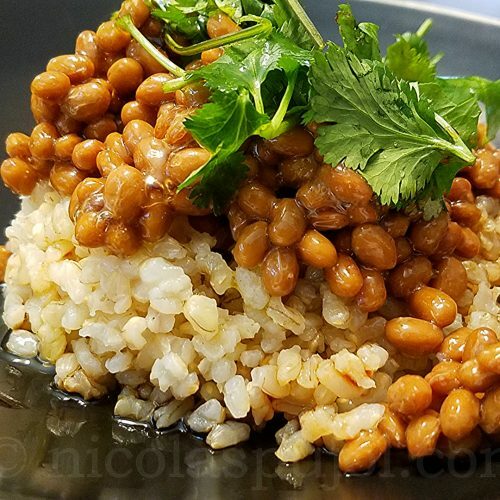 This dish provides another Japanese-French fusion creation based on natto. 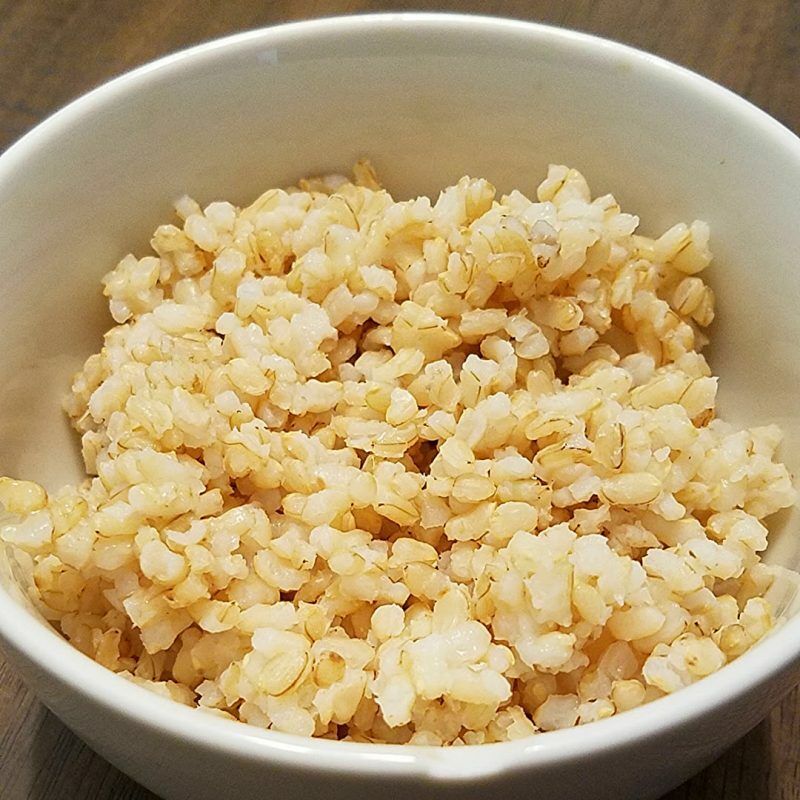 I used brown rice for this recipe, you can do the same with white rice. 1 cup cooked brown rice Make it separately, in advance. Place the hot and cooked brown rice on a plate. Add the natto, separating the beans across the surface. Finely chop the fresh herbs, then sprinkle them on the plate. Finish by adding the dressing of olive oil and soy sauce. 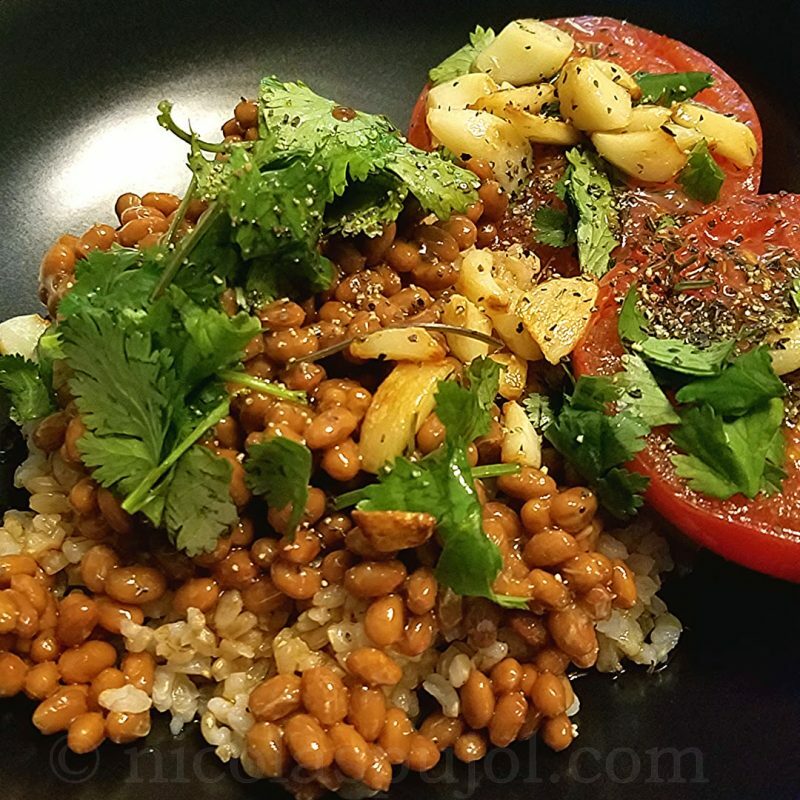 For this particular meal, I paired this French style natto and brown rice with tomates à la provençale, another typical dish from the south of France. It turned out to be a perfect match in flavor pairings and in colors on display.